I’ve been organizing my study, packing away books, tossing things out, and basically doing boring stuff for the past few days. However, on Thursday, I took on a fun project. I re-purposed an old globe. I created a planter that is now a “world class” one among the few that we have around our home. Last week’s: Photo challenge- Off-season. 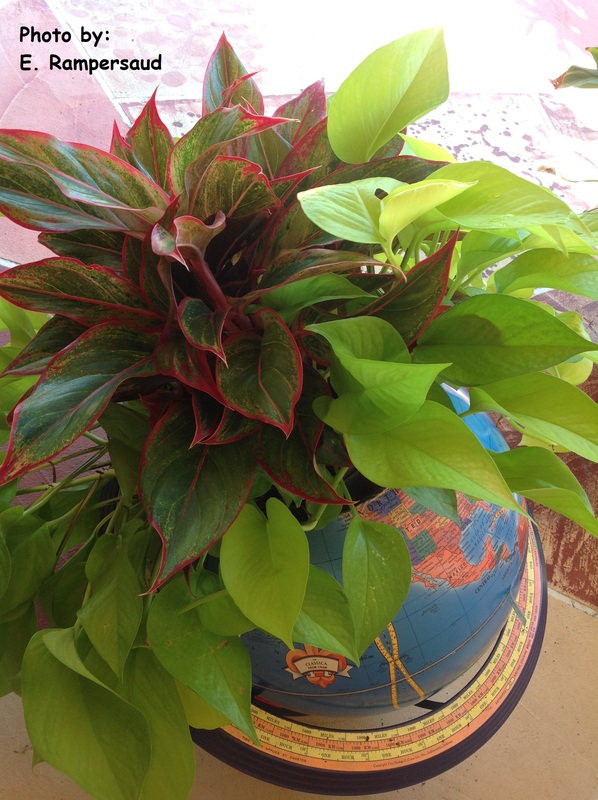 summer can be an off-season time for school, but now with my re-purposed globe planter, we can all learn a little something from it. Mark the area that you want to cut with a permanent marker. Get an old knife with a pointy tip. Light a candle and heat the tip of the knife. Insert the heated knife on the line you drew. The heat melts the thick plastic material. Repeat step 4 until the top of the globe is off. Place a plant in the planter. Paint the bottom of the base, so it doesn’t rust. Make holes in the bottom of the globe to let out water. This entry was posted in arts and craft, photography, recycling, Wordpress Weekly Photo Challenge and tagged creativity, recycle, weekly photo challenge. Bookmark the permalink. What a great idea…. so much better to repurpose something you like than have to give it away or worse yet, toss it! Thank you, RMW. I’m glad you like my planter. Thanks for visiting and commenting. Oh! How interesting! I like this idea. Glad you like it, Glynis. Have a great week. That’s a very clever idea Elaine and nicely executed. Dan, initially I was going to use a little saw, but I knew that would entail too much exerertion of energy on my part (I wanted an easier method). I remembered that when we needed to make an opening in a belt (when I was in Guyana) we used to heat the tip of a nail or an ice pick to create a neat hole. I applied the same strategy to the globe- in the comfort of my sofa with minimal effort. What a cool idea and creative idea, Elaine! It looks great! The neat thing about this planter is that I can tilt it to show off the beauty of the cascading plant. Enjoy the balance of your weekend! My continued best wishes to you with your writing goal. Pauline, if you ever come across one, you’ll have fun making this globe planter. Have a lovely weekend! 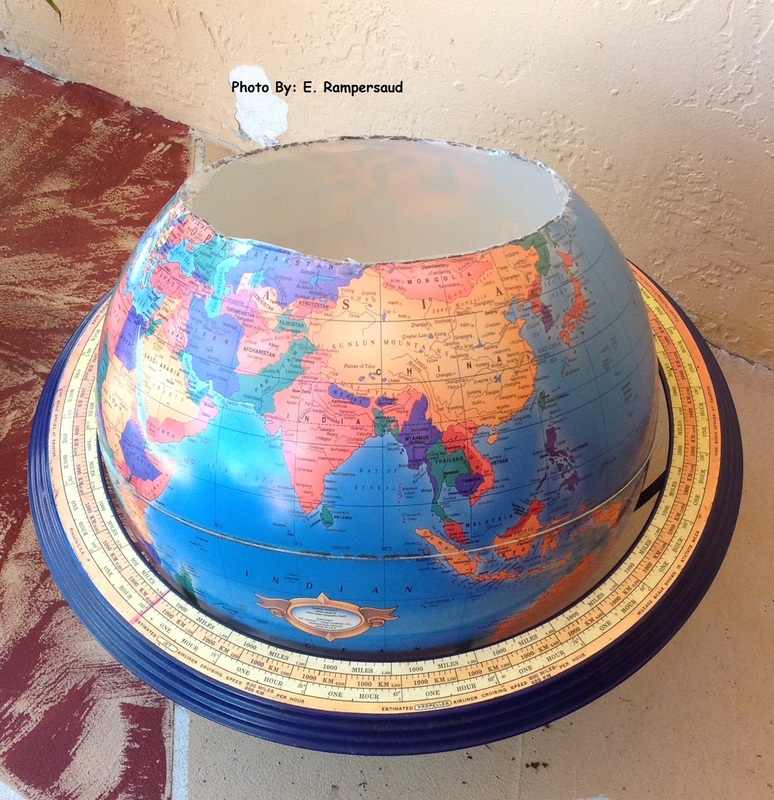 What a good repurpose for an obsolete globe. Sales will go down in the garden stores if I get my hands on all those obsolete globes😄. Enjoy your weekend, KB.